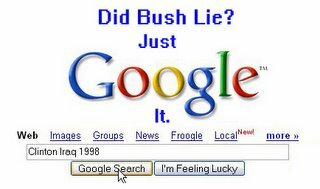 The NJ Blog: Did Bush Lie? Or, put another way, did President Bush lie about the threat of Saddam Hussein in order to lead the United States into an unnecessary war? It seems to be the question of the week so far. Check into it yourself -- just click the picture below (or Google it youself) and read. The quick answer is no, he didn't lie. He was following the same information his predecessor -- Bill Clinton -- was following in 1998 when he acted "without delay, diplomacy or warning."